There is a growing number of women who enjoy RVing independently, whether because their families are not into traveling, or because they are single, or just for the adventure of being alone in the wilderness. Many women who might consider independent RVing are hesitant to jump in and get started. That is where groups like RVing Women can help. Janet Miller has been a member of RVing Women for over 15 years. When she found herself nearing retirement, she relocated from her home in Wisconsin to Nevada in order to enjoy the warm Southwest climate. She had met some friends who traveled in an RV through work and found the lifestyle intriguing. After reading through the RVing Women magazine, filled with helpful and interesting information, she bought a small Class C motorhome and began traveling with her partner on weekends. Since that initial rally, Janet has made it a goal to get out with her RV at least once a month, with a “use it or lose it” attitude to keep her out exploring. There is no RVing women chapter in Nevada, so she joined as a member of the Arizona and Southern California groups in order to attend rallies in neighboring states. 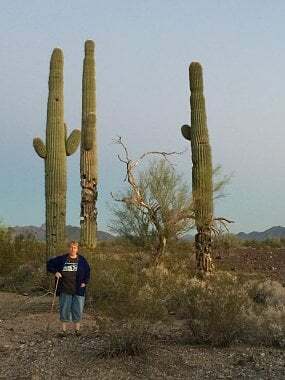 Through the years, she has become an active member and is hosting the upcoming boondocking rally in Quartzite, AZ starting January 17, 2019. Janet finds that the benefits of being a member of RVing Women are largely the safety and comfort of traveling in an all-women group with different lifestyles and life stories are accepted without fear or humiliation—regardless of your experience level. Single women, widows, divorcees, or those just looking to get away—the common thread is a group of women with a taste for adventure. Some have new, fancy rigs, others have found older RVs that they have creatively and lovingly refurbished to their individual needs and tastes. Some women are retired, others still working, and some are full-time RVers. Rally attendance can range from 20 to 100 and is largely dependent on the space available at the hosting site. Rally hosts work a year or two in advance to secure campsite areas, permits, and activities. Often rallies are coordinated around another event, like an RV Show, or music festival. In addition to the rallies, the group often hosts informal “meet-ups” throughout the year, from weekend trips to “rolling rallies” where members travel over many days or weeks as a caravan to enjoy destinations like the Grand Canyon or Yellowstone. These longer trips are great for single travelers who might be hesitant to attempt the journey by herself. There are 17 RVW chapters across the United States, and members can attend any rally across the US that interest them. Many members travel south for the winter and may join a southern chapter such as the Arizona or Florida Chapters, but return home during the summer months where they might participate in rallies associated with their home state area. 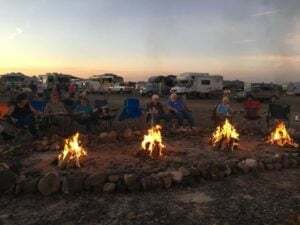 For more information on the RVing Women Quartzite Rally, click here. For other chapter rallies, visit the listing of events on the left side of the RVing Women web page. I just bought a 2011 sunseeker and am in love with it. I am a nanny and park it on their property(3acres) winter is coming and I’m unsure how to live in my wonderful new mini home. I have only had it for a.month. any info would bee much appreciated. You might consider EZ SNAP RV skirting. It will keep your tanks and underneath warm in cold weather. There are many you tube videos that will help as well. I think I recognize the native ruins in the picture of the topic introduction. Are they near Roosevelt Dam?